Are you a Property Manager or Owner? We focus exclusively on off-campus renters. Our listings and search pages offer unique options for college rentals. If you rent to undergrads, grad students, faculty or staff you should be listed here. Plus, it's free! Renters don't need to create an account to contact you. Your phone number, web address and other pertinent information can all be included with your listings. College renters want more options and details when they search for housing, and on our site you can include as much information as you like. This lets you better target your ideal tenants and get better qualified referrals. We offer premium listings for you to promote your rentals to college students, faculty and staff. Listings are 100% free with no commitments or gotchas. Post your rentals, and we'll send you qualified referrals. And when you're ready, we have a number of powerful, yet completely optional, paid advertising options available. When an interested apartment hunter wants to contact you about a property, their request is immediately e-mailed to you. You'll instantly know which floor plan(s) your potential tenant is interested in, plus contact information. Of course, we don't charge for referrals either. 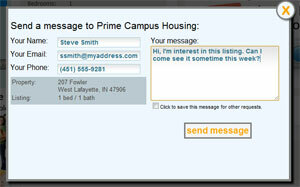 Your site has been a terrific tool for us in marketing our large and varied apartments to Purdue University students. 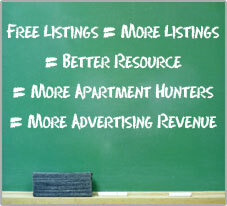 Its free listings service has saved us hundreds of dollars as we've used it to replace paid advertising. The free customer service has been great as well. We plan to continue using this as a key component of our marketing strategy. Add as much (or as little) detail about your listings as you like. Other rental listing websites offer just the basic information (bedrooms, bathrooms, rent rates and descriptions). We offer much more, plus details specific to off-campus renters. When potential tenants have more information about your listings, they'll be that much closer to signing a lease. Plus, unlike many other sites, we let you include your phone number and links to your website, facebook page, and twitter accounts. 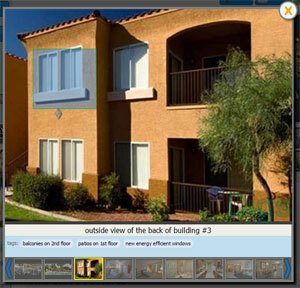 Show off your listings with an unlimited number of high quality photos. We also offer you convenient features like cropping and letterboxing your pictures directly from our photo manager page. And that's not all... Add captions and tag areas on your photos to better accentuate your unique offerings. It's easy for potential tenants to contact you. Renters don't need to create an account to search, view your listings, or send you a message. Plus, you can show your web addresses and phone number to provide even more ways for people to get in touch with you. By making it easy to reach you, you end up with more referrals. When someone contacts you, we pass along all of the contact information they provide. This lets you decide how and when to respond. That's not all! Want referrals sent to your leasing agents AND your manager? You can have referrals sent to multiple email addresses. Spend less time keeping your listings up-to-date with innovative features like our Bulk Updater. 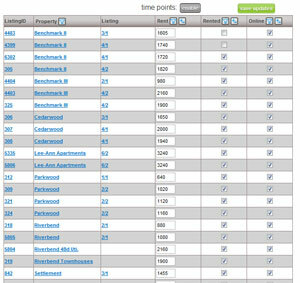 Make changes to rental rates and availability to all of your listings with just a few clicks. Use Listing Snips to quickly make changes to key details across multiple listings in the blink of an eye. Have units available now, but have a different rate next school year? Our innovative TimePoints let you clearly and easily show both.